I went to check mail the other day and there, between the front doors, were was a baker’s dozen eggs. The thirteenth egg was resting beside the box on the ledge. It was so large, it wouldn’t fit in the box. It was a Goose Egg! We couldn’t wait to try the goose egg! But how on earth could something so large be equated to zero? A large swelling or lump, yes! But zero?? One whisked goose egg is easily equivalent to three decent sized chicken eggs. We decided that we would have the goose-egg as an omelette with Chinese-style rice. I have to confess that I was a little nervous. I was given to understand that it would have a stronger flavour than chicken eggs. And certainly, goose is very much stronger flavour than chicken. Still, we forged ahead. We had to. There wasn’t room in our fridge for that giant egg. First, we had a discussion about whether to add tofu. I confess that I’m not wild about tofu. I don’t know what it is about it that bothers me. Is it that fried firm tofu has the texture of chicken but is taste-free? I agreed that my views on tofu are ridiculous. And we decided this might be just the way to get me to change my mind. Next, T cracked open the goose egg. It wasn’t easy. The shell is hard; the shell is thick. But at last its lovely contents emerged. It was beautiful. It looked and smelled just like a chicken egg. A giant chicken egg (that’s a 25 cent piece in the photo). Then, we fried onions, firm tofu, mushrooms and two kinds of peppers. The little red peppers are devilishly hot!! Then we pushed those to the sides and added the whisked goose egg. Once the egg was done, we stirred in leftover rice from the night before. Directly after serving the rice, we drizzled on toasted sesame oil and scattered overtop a few sprouts from our “winter garden” in the dining room. he: So? What do you think? me: It’s good! It tastes like chicken… [sniggering, then adding more seriously] I actually can’t taste any difference between it and a regular egg. he: Me neither. It tastes exactly like a chicken egg. But what do you think about the tofu? me: It tastes like… [picking out a piece of tofu and chewing it thoughtfully] …tofu. Breakfast was delicious. Of course, it was. Aldergrove Tiny-Scale Farm is located on 75 acres of rolling hills, pasture, forest and cedar wetlands in Grey County, Ontario. […] [O]ur laying hens […] include some heritage breeds such as Ameracauna and Barnevelder, and they are accompanied by “Wally and the girls”, a very noisy gander and his two geese. edit 22 April 2013: Have others noticed that they are getting fewer comments on their blog postings? I’m blaming Facebook…. Not long ago, my sister mentioned that she forgets to come to look to see if there are new posts here and suggested that I post about them on FB. Well. I’ve done that on a couple of occasions. And EVERY time, it merely generates comments in FB. Of course, by the very nature of FB, the comments disappear almost immediately. Sometimes I don’t see them. Waaaaahhhhh!! edit 20 April 2014: If you are in the Parkdale area, you can arrange to get Free-Range Poultry eggs from the Aldergrove farm. The family working the small farm is still the same but their name has been changed to Little Valley CSA Farm. » I love asparagus season…. This entry was posted in food & drink on Sunday, 21 April 2013 by ejm. I have found goose eggs are splendid replacements for chicken eggs for any recipe or even on their own boiled/scrambled/poached etc. 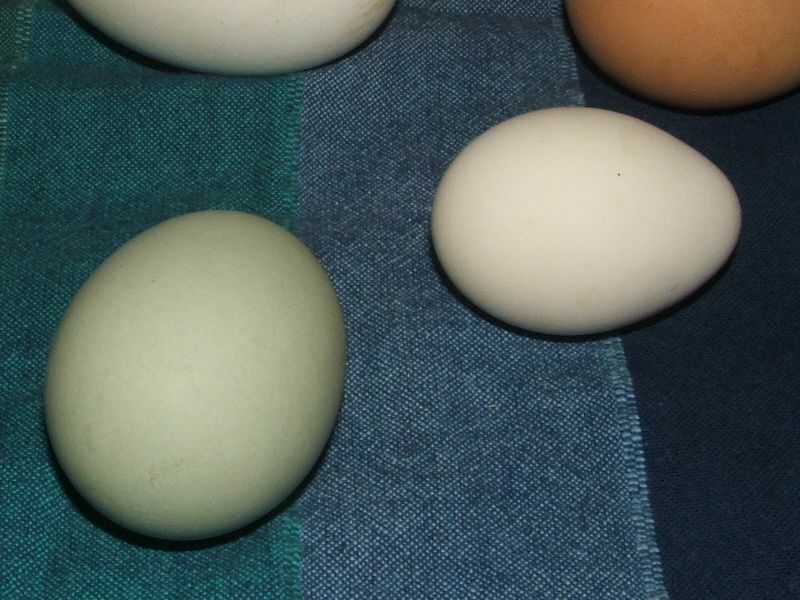 I can also recommend turkey eggs for the same purpose although it has been many years since I have seen them for sale. The duck eggs I have eaten were much richer than chicken eggs and if I were to cook with them I think I would use half as many as chicken eggs in a recipe. so you think you don’t like okra, eh?